Choice of three different blue-green Soy Luster shades for the background pattern - Bayou Shadows, Hummingbird Wings or Indian Jewelry. Course Description:Sand dollars are commonly found on the beaches in the mid-Atlantic region and along the Gulf Coast and the legend associated with it in many Christian circles have made it one of the most popular seashells. 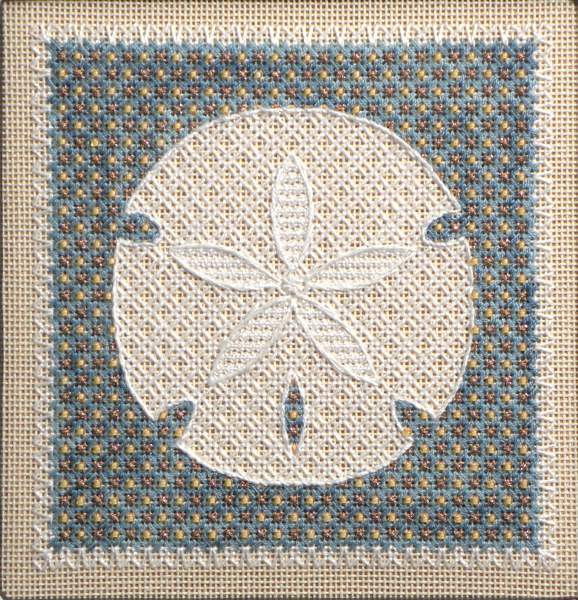 The usual round shape of this symmetrical shell is established on the canvas with a charted outline that is executed in back stitches after the sinking holes for these stitches are poked on to the canvas with a large needle or laying tool. These back stitches are whipped later to assure smooth curves and eliminate the visibility of the dimpled holes. An open blackwork pattern is used to suggest the texture of the tiny spines that would have covered the shell in its living state. A denser allover pattern fills the five “petals” in the center of the disk and these radiate around a tiny whipped spider. These petals are defined with similar poked hole patterns and then outlined with softer modified Jessica stitches. The filling here is an unusual one that I made up after the small scale open couching pattern I thought would work proved ineffective. By adding pairs of mirrored Tent on the upper and lower sides of the staggered Brick couching stitches in a finer weight pearl cotton, I ended up with small circle repeats that formed an ideal allover pattern. It appears somewhat like a miniature Rococo stitch and I think it will be very useful in future designs as well. BACKGROUND. Four-way clusters of Reverse Mosaic units form the main network for this background pattern. Two accents are added to complete the composite pattern. Sand-colored frosted beads are attached with Brick stitches to fill the small diamond areas and Smryna Crosses are added to the exposed squares in copper metallic. EDGING. Instead of a border a simple blackwork edging surrounds the background, using white pearl cotton to suggest the sea foam on the waves as the water rolls on to the beach. TEACHER PROVIDES. All materials needed to complete the design plus a detailed instruction booklet with a color cover. MATERIALS PROVIDED BY STUDENTS. 10" X 10" stretcher frame, embroidery scissors, laying tool, clamp or frame weight to secure the stretcher frame to the working table, plus any other normal accessories needed to work on an 18-count ground (light, magnifier, etc.). 1. To show two different ways to do blackwork outlines that will conceal all of the traveling threads. Many canvas enthusiasts resist doing blackwork because they dislike the double running technique. My combination technique of alternating running stitches with back stitches is not only more comfortable but it allows the pattern to emerge quickly so it can be memorized sooner. I also manipulate the outlines in unconventional ways to avoid having crooked lines. 2. The concept of a shoelace technique to minimize the number of starting and ending tails will also be introduced. Open patterns have limited areas for securing threads and this technique avoids any overload in the backings. 3. To discuss different ways to set up precise charted outlines for canvas designs. 4. To discuss planning appropriate backgrounds, borders and/or edgings for a design to support the theme.